Learn the basic stitches used as a foundation for any beading projects. Each one-day class focuses on one beading stitch and can be taken in any order. 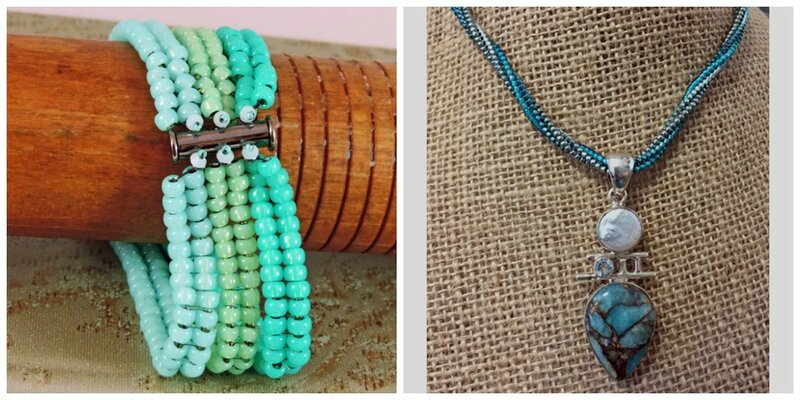 After completing these classes you are ready to tackle anything else in the beading world. Choose one of these projects (pictured from left to right:) Herringbone 101, Ndebele 101. Theresa may offer more than one class on her teaching days. The first 2 students to register on a given day determine which projects are taught that day. If you register on line we will call you to confirm your choice. Note: Our flexible schedule means that recent changes at the shop may not be reflected on line! Please don’t sign up on the website a day or two before class--give us a call to make sure there is a class and that there is room for you. Thank you.